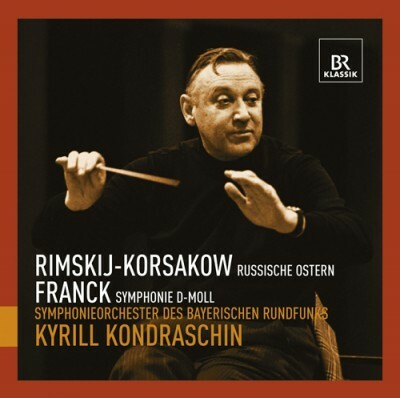 This recording of a concert from 1980 in Munich's Herkulessaal with Kyrill Kondraschin containes a versatile and exciting programme with two late romantic pieces who complement each other: Rimskij-Korsakows "Russian Easter" Ouverture and César Francks only Symphony. Kyrill Kondrashin and the Symphonieorchester des Bayerischen Rundfunks: what had been planned as a happy relationship between the significant representative of the Russian conducting school and the first-class Munich ensemble ended tragically with the sudden death of the conductor before he could assume the position of Chief Conductor of the orchestra. All the more significant is thus this sound document. The live recording made at concerts in Munich’s Herkulessaal comprises an exciting program that juxtaposes two late romantic works from different symphonic cultures: Rimsky-Korsakov’s “Russian Easter” Overture and César Franck’s only symphony, in D minor. One of the few testimonies to the collaboration between Kyrill Kondrashin and the Symphonieorchester des Bayerischen Rundfunks.